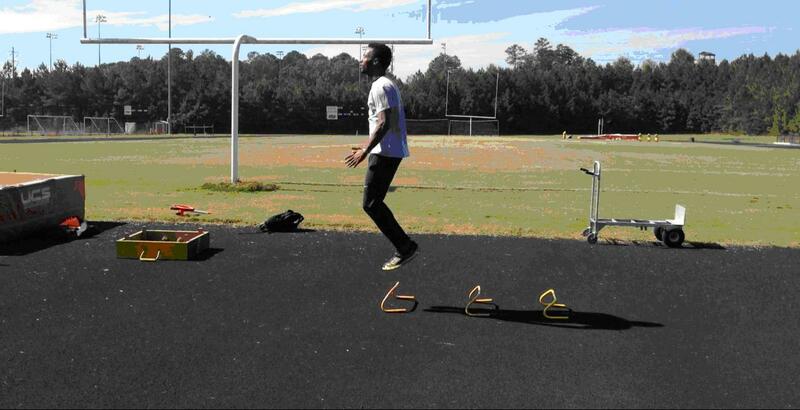 The use of plyometrics / bounding is fundamental to the training programs for jumpers and sprinters. Using them constructively and through periodization (seasonal and organized phases) will enhance performance and reduce the risks of injury. 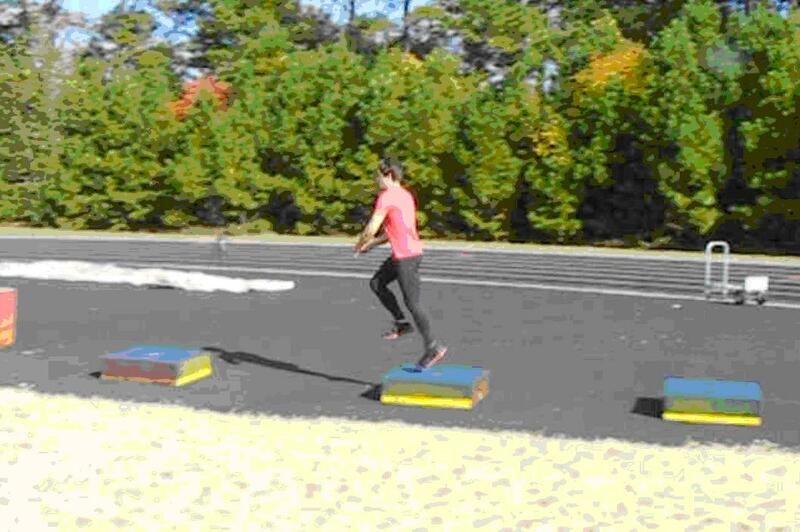 From basic through advanced training, novice to elite athletes can progress (using plyo’s) in any event requiring speed and power. 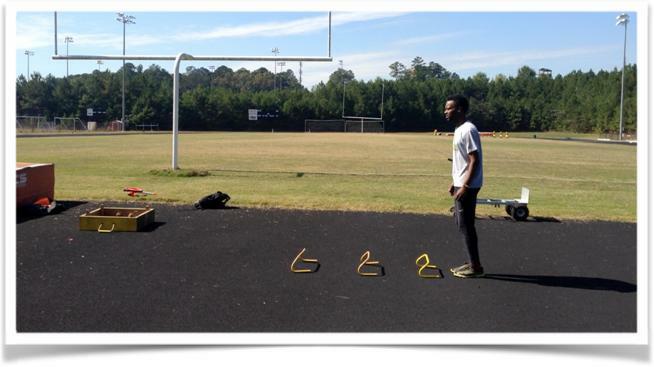 The photo sequences contained in this article are organized from a perspective of specific warm-up, general drill progressions for posture, rhythm, and force application. 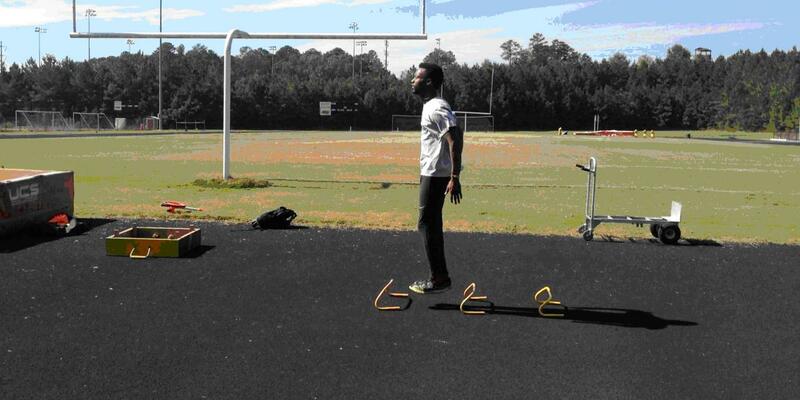 The proper use of dorsiflexion, posture (tall stance with proper hip angle), balance, coordinated rhythm, and “active contact” are utilized with these drills. 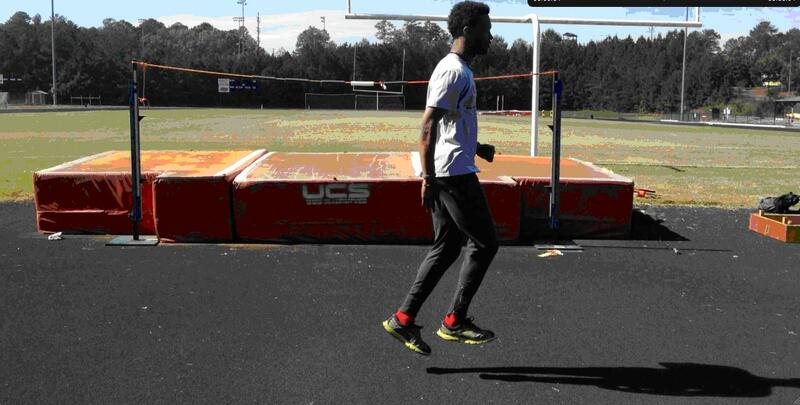 SPECIFIC WARM-UP – denotes the use of smooth and rhythmic movements that relate to the skills of successful jumpers. Among these skills are acceleration, increase of force production, triple extension (hip, knee, and ankle extended) in take-offs. These movements *shown above are precursors to the use of advanced drills. 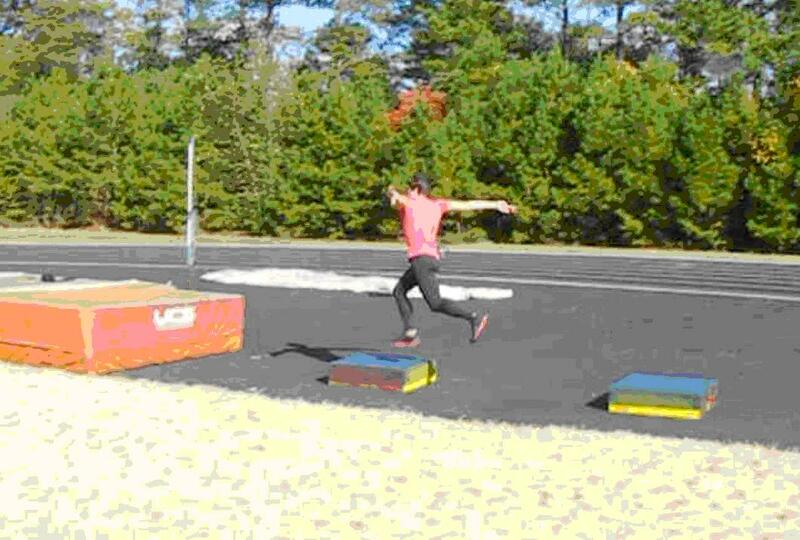 GENERAL DRILL PROGRESSIONS – these activities range from double leg hops; low box double leg jumps using “active landings” (flat to rolling contacts with immediate rebound into the next jump) caveat – these movements are more dynamic than the warm-up. 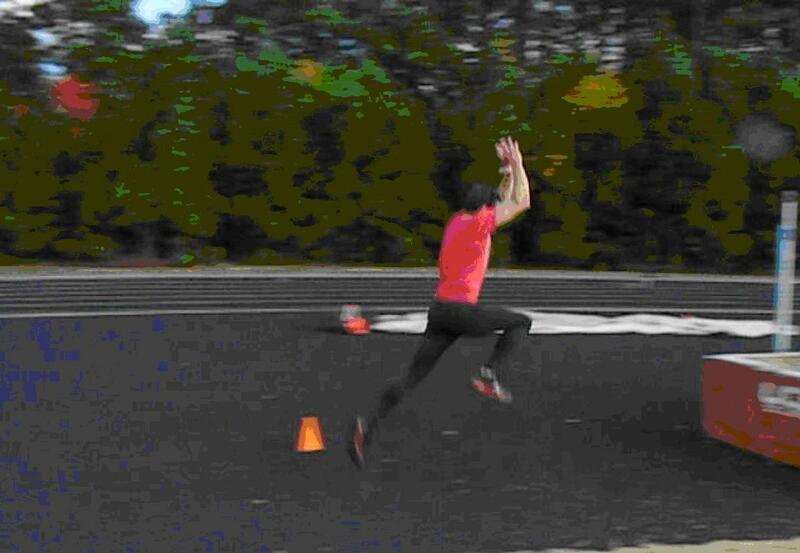 Athlete should use medium to high intensity in execution. 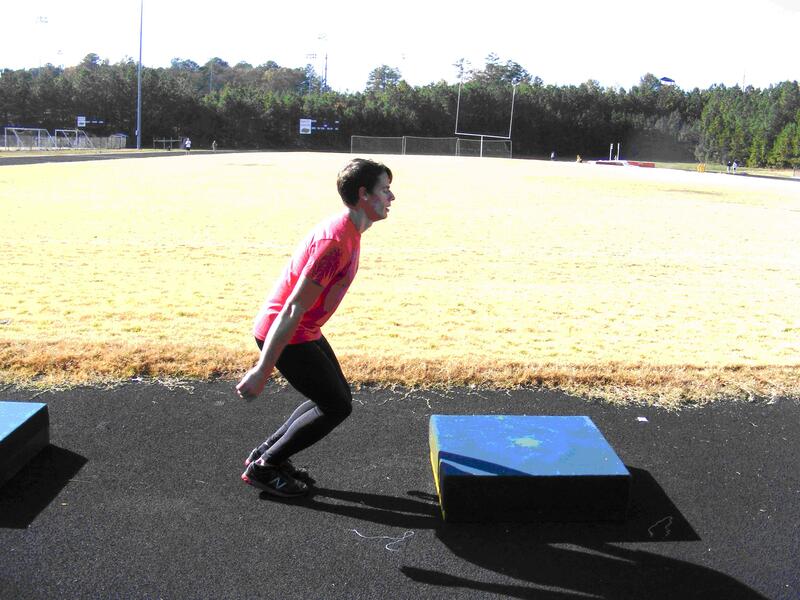 *my experience ranges from youth to collegiate training; coaches observation and better yet pre-testing for strength should be the determining factor. 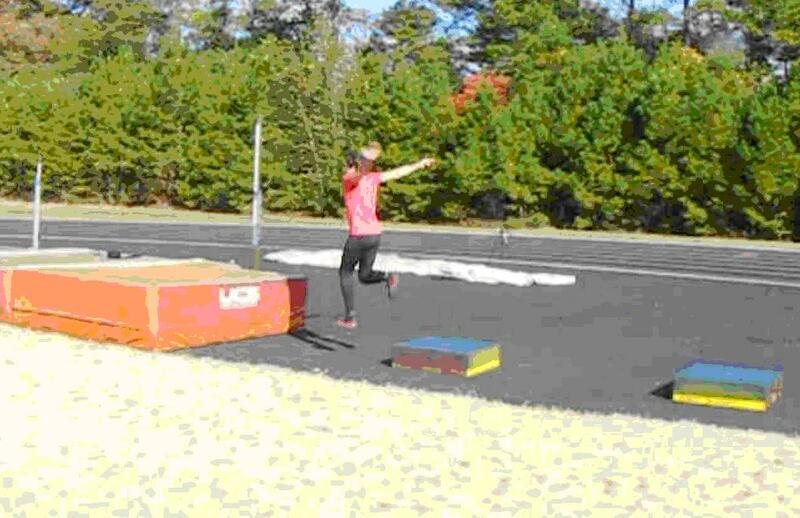 DOUBLE LEG JUMP GROUND – BOX – GROUND – BOX ……. ADVANCING BOUNDING – this is basic bounding, but with the addition of cones. “Target Bounding” can be a workout of its own. 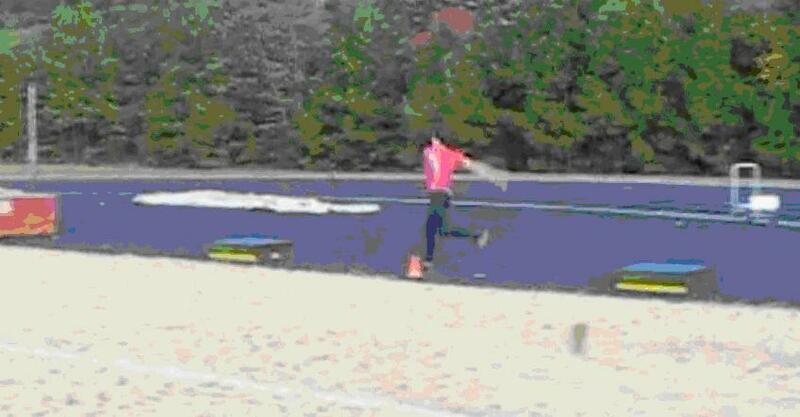 Adjust the cones at distances that challenge each athlete. Regardless of the measure, it’s vital to maintain postural control and balance. Avoid reaching! This negates any benefits of any drill of this nature! 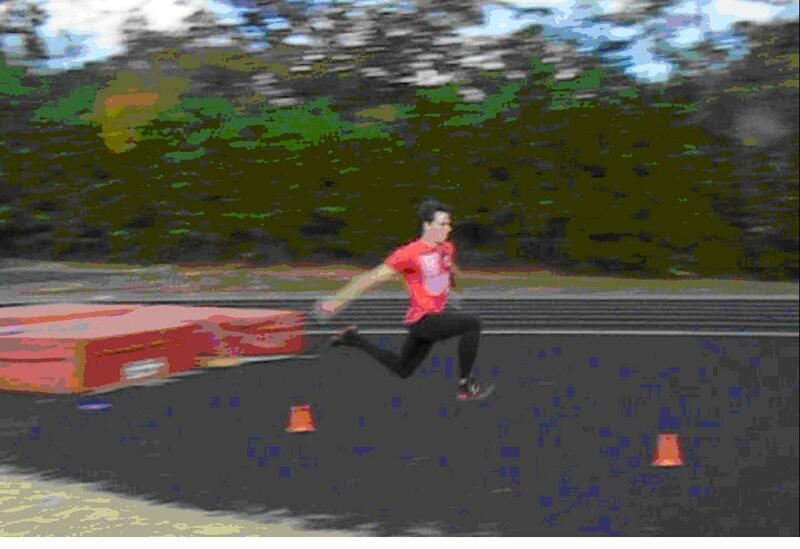 In each landing, the hip should be over the contact foot!! 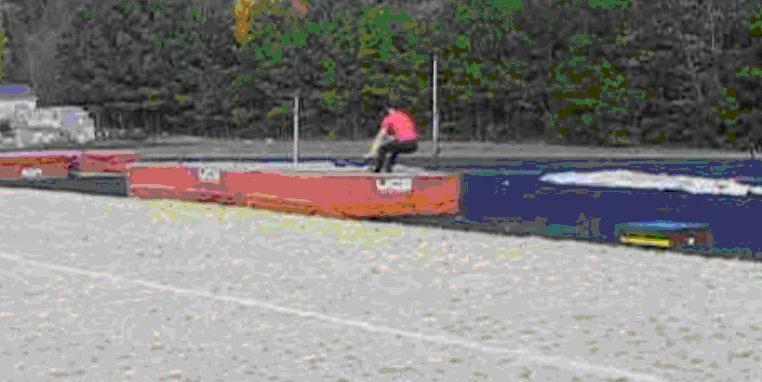 It’s also a benefit to use a landing pit to work on full extension at the finish. 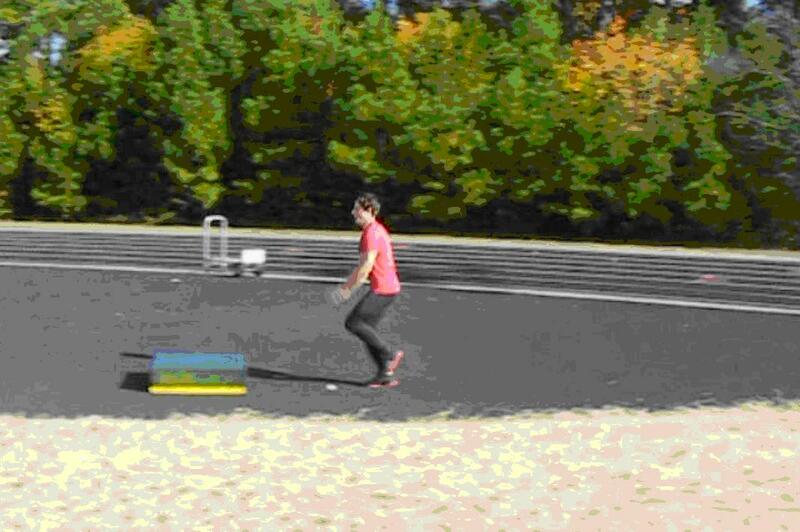 The next segment will include box drills and training for the advanced athlete. Flat to “rolling” active contact. Land Flat with minimal knee flexion. keep the head, shoulders, and hips over the contact foot! Maintain upright posture, “toe up”. 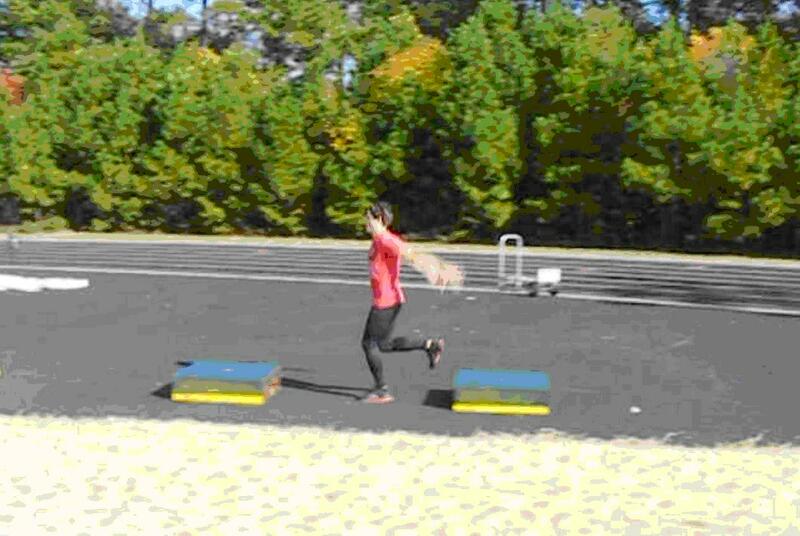 Emphasize triple extension on landing phase. > consider the maturity and ability of each athlete! > Land with hip over the foot. > Keep knee flexion to a minimum. > Avoid aggressive knee drive, roll the foot contact, push the hip vertically. 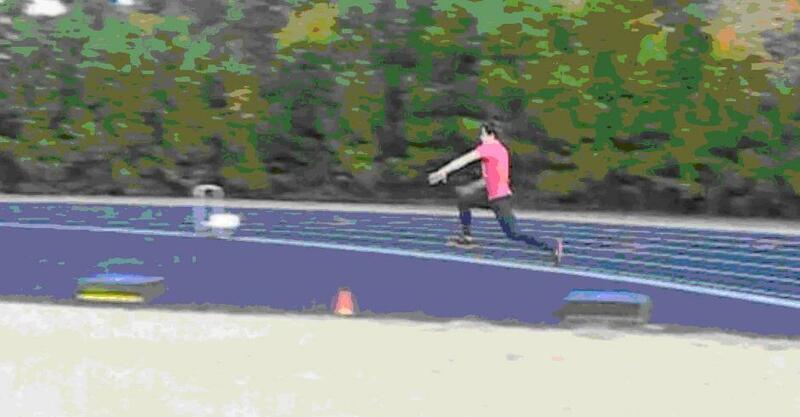 > Maintain velocity through the finish. For beginners / Good introduction for teaching force application and rhythm. 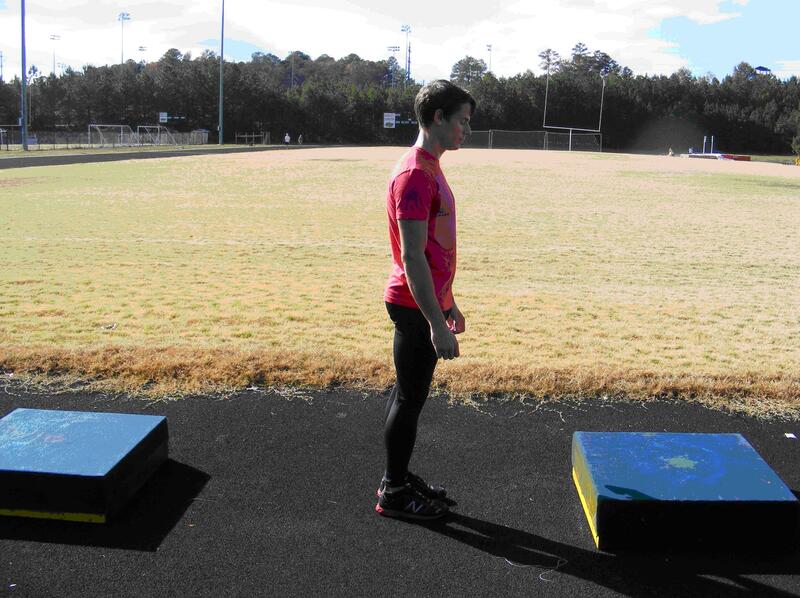 Use standing starts for beginner drills. 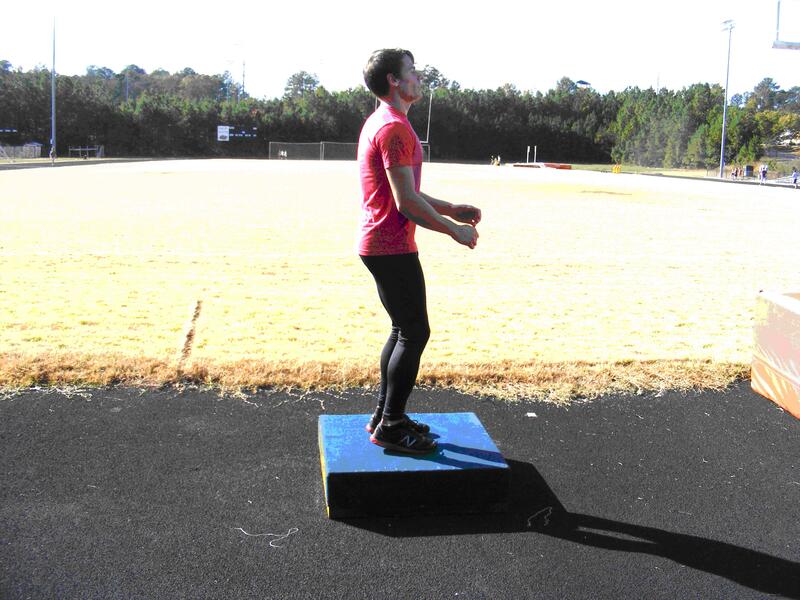 Keep posture upright and stable, move the hips/feet over the center of the box! Keep landing active with control and good posture! Hip extension is vital to learning proper force application. Hips are behind the feet, emphasize active pushing and keeping hips high. 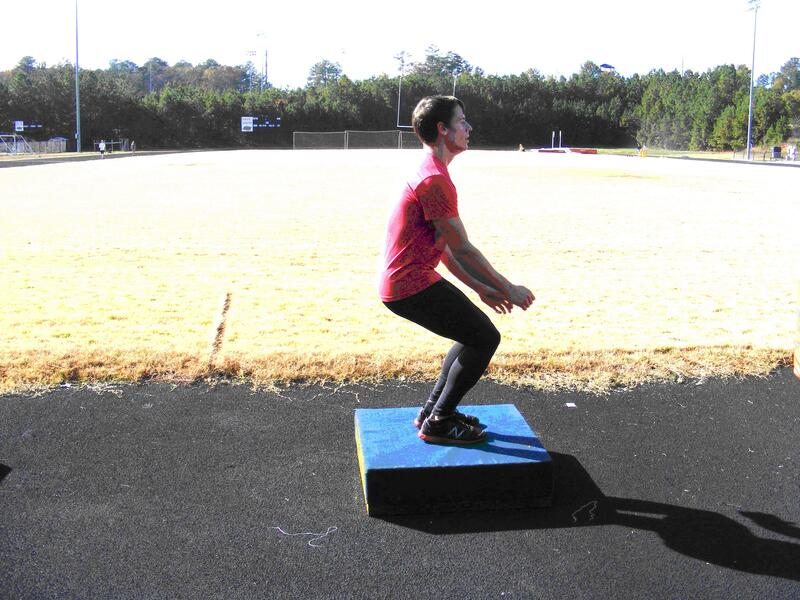 Though some knee flexion is necessary for safety, a squat position leads to a slower movement and longer contact to ground or box; working on eccentric strength and core stability will help with this issue. 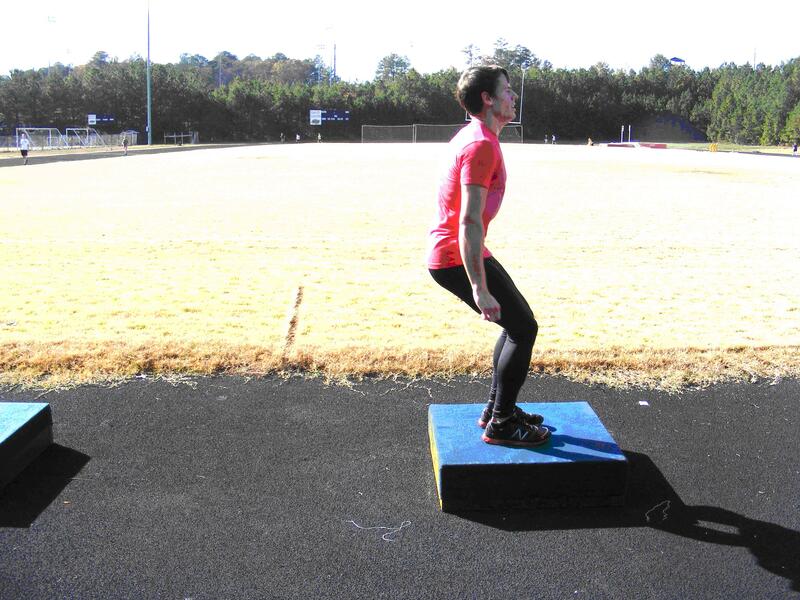 Forward lean and anterior pelvic tilt prevent the athlete from using force properly and compromises the ability to balance as well as reduce the mobility of the hip flexors; postural drills and hurdle mobility drills can reinforce postural integrity. * The athlete depicted in this article weighs approximately 67 kg. and power cleans 88 kg. 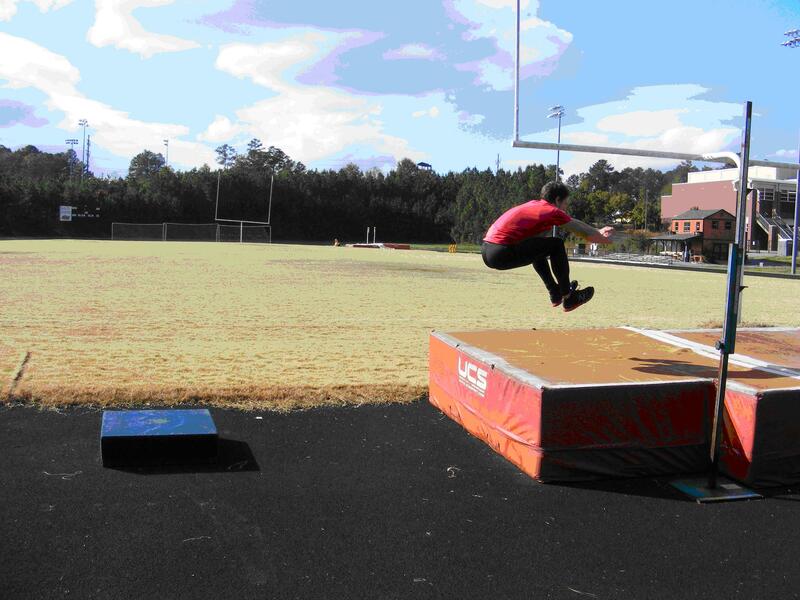 Fall training consisted of fundamental bounds at 6 X 30 meters, including multiple hop and double leg jumps. These were executed on a Monday/Thursday. 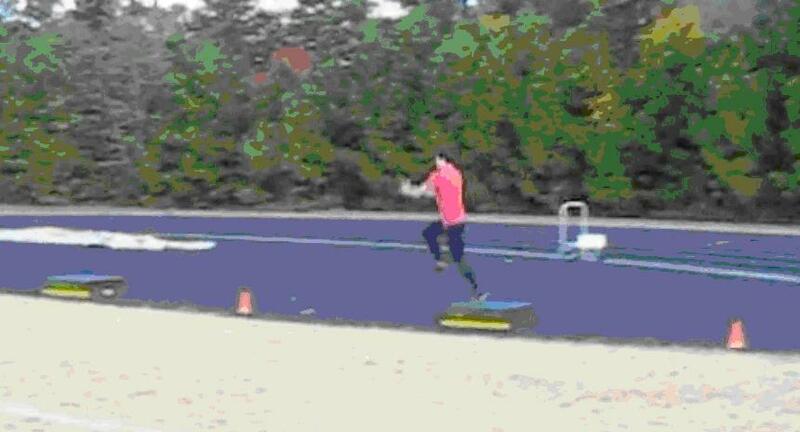 Much of the sprint training was 4X4X10-20-30-40 meter repeats . Tuesdays were 6-8 120meter hill repeats. 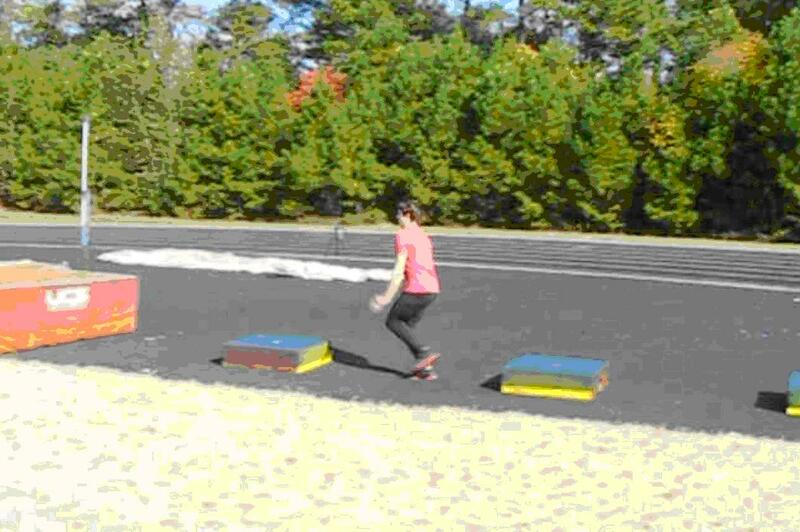 The box bounding began in early November, “low volume and graduating intensity” – boxes were 25 cm. / 10 in. in height. 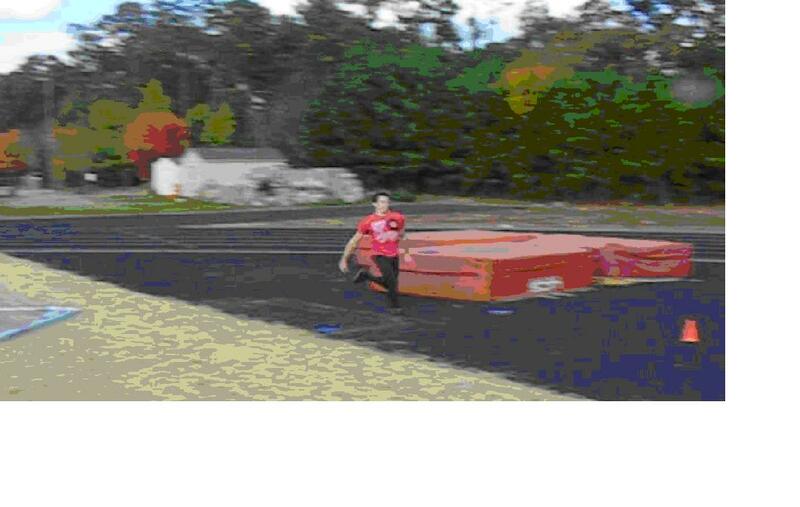 The distance ratios and box heights were determined by “pre-testing”. 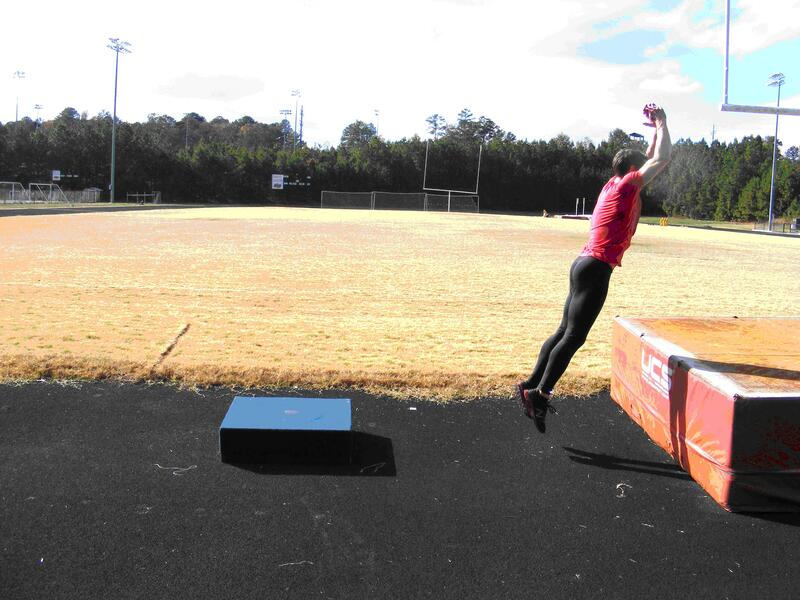 Several of the jumpers I coached “never” reached a level of strength to perform the more challenging drills. This is the fine art of coaching; I do not believe in “cookie cutter” programs where all athletes do the same workouts. Captions below photos state critical points when viewing performance! 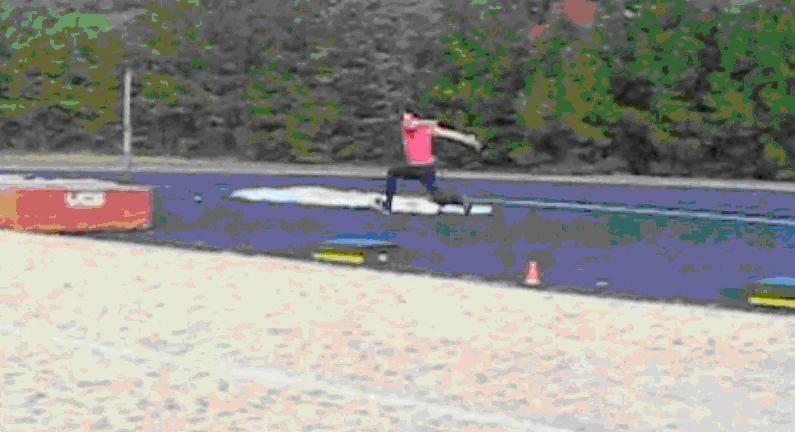 Posture and hip alignment are excellent; lead knee over foot preparing for contact. 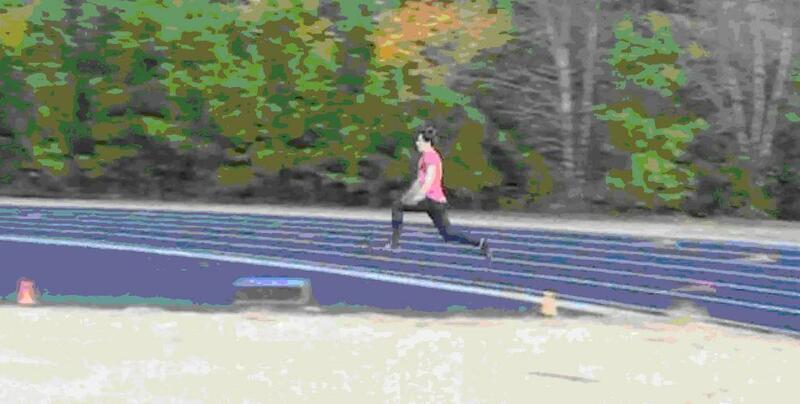 Arms were back and now forward accelerating torso. a vital part of maintaining acceleration! coordinated with foot, contact for momentum. Take note of the swing leg position. Swing leg does not drive above the waist line! The hip is the rudder! Momentum is maintained with chest up and focus up and forward. Arms “block” at chin before rising to counter rotation. Shoulders and chest remain upright as long as possible on landing. 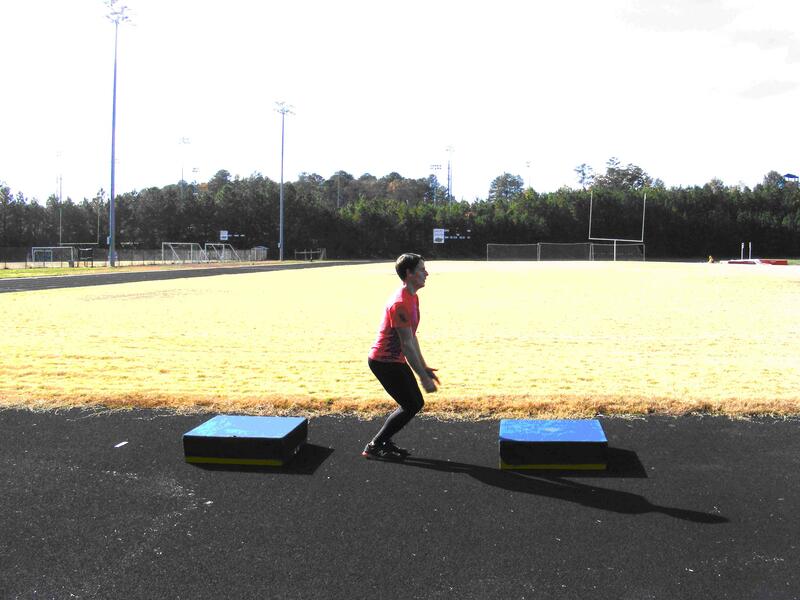 Maintenance of posture, rhythm, balance, and momentum are the determining factors in making box workouts safe and effective! 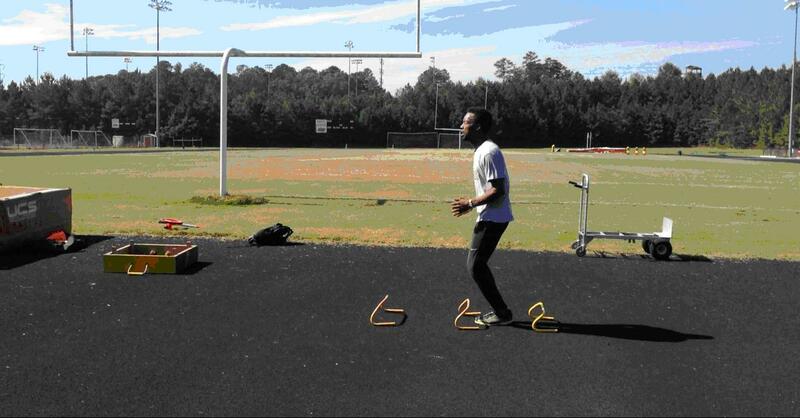 The posterior chain, core, and lower leg/feet complex must be conditioned! Even very strong athletes who have no experience in bounding and elastic strength activities may have difficulty in executing basic bounding drills. 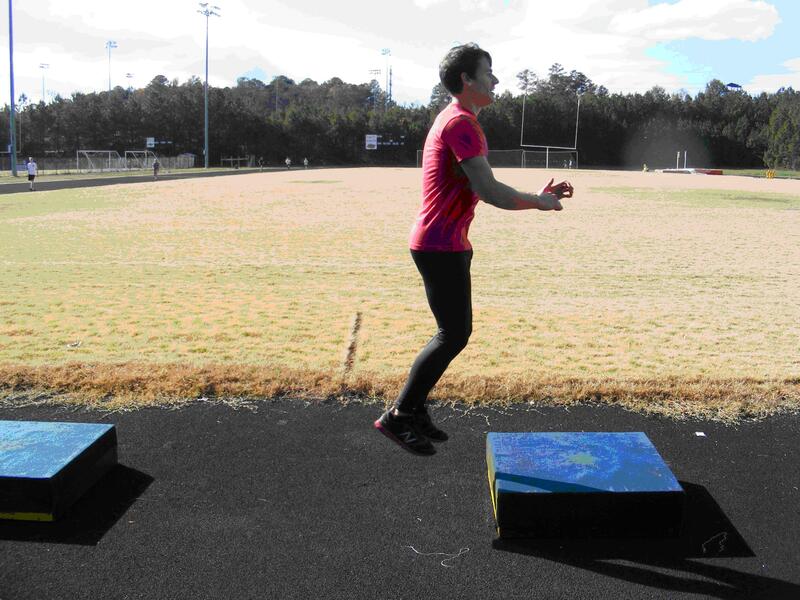 Much of the learning and success of plyometric training is interconnection of the nervous system to the muscular system. This includes fascia, muscle/tendon apparatus, and overall joint integrity. 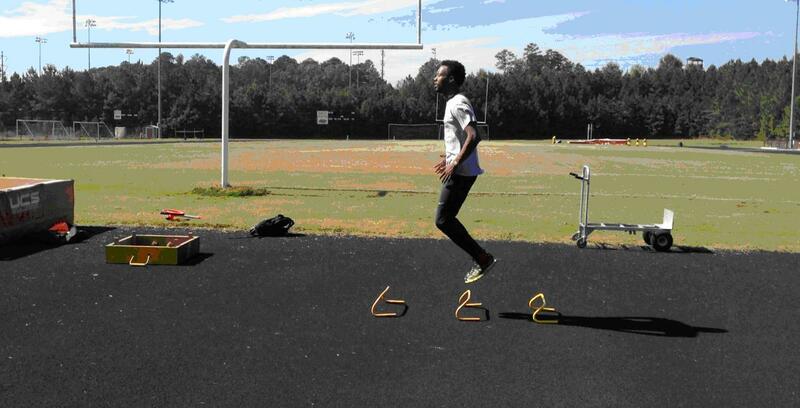 I strongly encourage readers to explore Complete Track and Field.com for a better understanding of the specifics of jump training!